Huawei Honor 9 has been unveiled, like its predecessor, Huawei Honor 9 comes with dual camera setup and beautiful classic design that draws many users' attention, besides, Huawei upgraded its battery size, chipset, camera, ram, etc compared with the Honor 8, which makes it a great competitor for other Android flagships. So if you used to be an iOS user, who now wants to switch from an iPhone to an Android device, then Huawei Honor 9 can be one of your best choice. And when you switched from an iPhone to the Huawei Honor 9, you need to make sure all your private data on the old phone come with you. However, transfer data from an iOS device to an Android device might be troublesome because of the different platforms. And that's what this article is going to talk about, that is, seamlessly transfer contacts, call logs, SMS, DCIM photos, music, videos and more from iPhone to your new Huawei Honor 9. 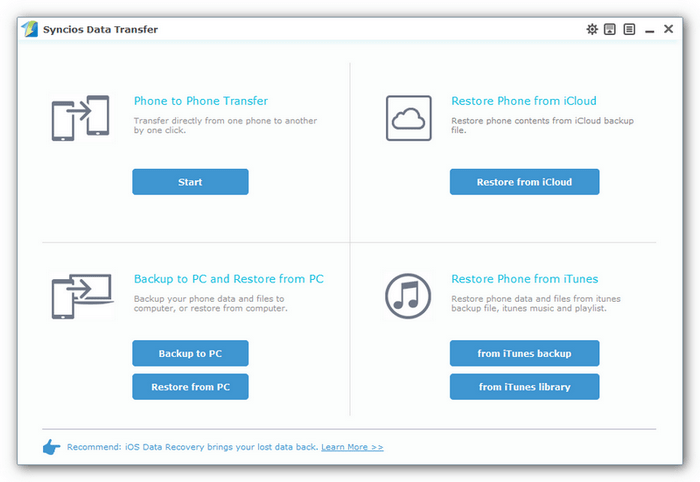 STEP 1: Download and install the compatible version of Syncios Data Transfer on your computer, launch it. 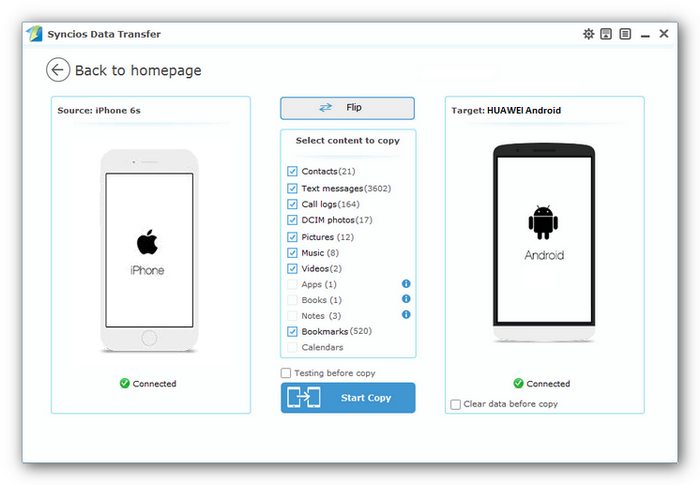 Select Phone to Phone Transfer module on the homepage. Step 2: You would see the program asked you to connect devices, so simply connect both of your iPhone and Huawei Honor 9 to computer with USB cables(Huawei Honor 9 can be connected via WiFi network as well), Syncios Data Transfer would load data on your device after successfully detected your device. Make sure iPhone was listed on the left(source device) while Honor 9 on the right(target device), you can hit Flip to exchange the position. TIPS: Make sure you have enabled USB debugging mode on Honor 9 device. Step 3: Check your desired contents, click here to learn what types of data are supported to be transferred between two different devices. Then click on Start Copy button to start the process of transferring, before long, all of the data you'd like to transfer to your Huawei Honor 9 will be synchronized successfully. Tips: Please make sure that both of your devices are connected well with your computer during the transferring in case of some unknown error occurred. How to Backup and Restore Huawei Honor 8? How to Backup and Restore Huawei mate 8?